Both Cocoa and Core Foundation provide run loop objects to help you configure and manage your thread’s run loop. A run loop is an event processing loop that you use to schedule work and coordinate the receipt of incoming events. The programmatic interface to objects that manage input sources. 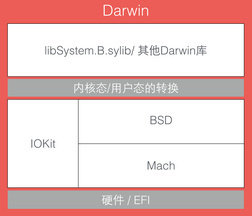 note: Swift 开源后，苹果又维护了一个跨平台的 CoreFoundation 版本适配了 Linux/Windows. A run loop is an event processing loop that you use to schedule work and coordinate the receipt of incoming events. The purpose of a run loop is to keep your thread busy when there is work to do and put your thread to sleep when there is none. Your application neither creates or explicitly manages NSRunLoop objects. Each NSThread object—including the application’s main thread—has an NSRunLoop object automatically created for it as needed. If you need to access the current thread’s run loop, you do so with the class method currentRunLoop. NSTimer objects are not "input"—they are a special type, and one of the things that means is that they do not cause the run loop to return when they fire. Warning: The NSRunLoop class is generally not considered to be thread-safe and its methods should only be called within the context of the current thread. NSTimer: A timer that fires after a certain time interval has elapsed, sending a specified message to a target object. 1)  Port-based input sources monitor your application’s Mach ports. 2)  Custom input sources monitor custom sources of events. The only difference between the two sources is how they are signaled. For example, in Cocoa, you never have to create an input source directly at all. You simply create a port object and use the methods of NSPort to add that port to the run loop. The port object handles the creation and configuration of the needed input source for you. In Core Foundation, you must manually create both the port and its run loop source. Configuring a Port-Based Input Source. To create a custom input source, you must use the functions associated with the CFRunLoopSourceRef opaque type in Core Foundation. You configure a custom input source using several callback functions. Core Foundation calls these functions at different points to configure the source, handle any incoming events, and tear down the source when it is removed from the run loop. a perform selector source removes itself from the run loop after it performs its selector. Like input sources, timers are associated with specific modes of your run loop. In your code, you identify modes by name. You can define custom modes by simply specifying a custom string for the mode name. You must be sure to add one or more input sources, timers, or run-loop observers to any modes you create for them to be useful. It is a loop your thread enters and uses to run event handlers in response to incoming events. A run loop receives events from two different types of sources. 1)  Input sources deliver asynchronous events, usually messages from another thread or from a different application. 2) Timer sources deliver synchronous events, occurring at a scheduled time or repeating interval. VI、 When Would You Use a Run Loop? A run loop object provides the main interface for adding input sources, timers, and run-loop observers to your run loop and then running it. Every thread has a single run loop object associated with it. In Cocoa, this object is an instance of the NSRunLoop class. In a low-level application, it is a pointer to a CFRunLoopRef opaque type. Although they are not toll-free bridged types, you can get a CFRunLoopRef opaque type from an NSRunLoop object when needed. 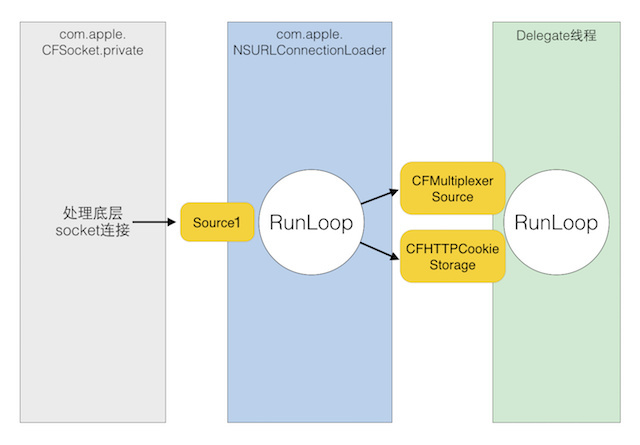 The NSRunLoop class defines a getCFRunLoop method that returns a CFRunLoopRef type that you can pass to Core Foundation routines. Because both objects refer to the same run loop, you can intermix calls to the NSRunLoop object and CFRunLoopRef opaque type as needed. Before you run a run loop on a secondary thread, you must add at least one input source or timer to it. A run loop must have at least one input source or timer to monitor. If one is not attached, the run loop exits immediately. When you use a timeout value, the run loop runs until an event arrives or the allotted time expires. 1) If an event arrives, that event is dispatched to a handler for processing and then the run loop exits. Your code can then restart the run loop to handle the next event. 1) Configure the run loop to run with a timeout value. 2) Tell the run loop to stop. Specifying a timeout value lets the run loop finish all of its normal processing, including delivering notifications to run loop observers, before exiting. topping the run loop explicitly with the CFRunLoopStop function produces a result similar to a timeout. Adding an input source or timer to a run loop belonging to a different thread could cause your code to crash or behave in an unexpected way. 1)The information you want your input source to process. 2) A scheduler routine to let interested clients know how to contact your input source. 3) A handler routine to perform requests sent by any clients. 4) A cancellation routine to invalidate your input source. uses an Objective-C object to manage a command buffer and coordinate with the run loop. After it hands off its data to the input source, a client must signal the source and wake up its run loop. 2) and in Core Foundation you use the CFRunLoopTimerRef opaque type. These methods create the timer and add it to the current thread’s run loop in the default mode (NSDefaultRunLoopMode). see its description in CFRunLoopTimer Reference. Both Cocoa and Core Foundation provide port-based objects for communicating between threads or between processes.